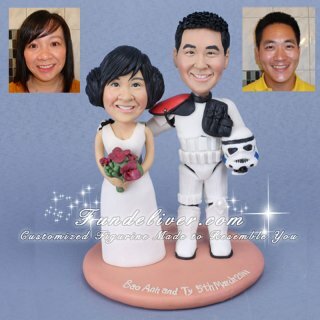 This is a completely customized Star Wars wedding cake topper ordered by one of our customers. Thank Anh and Ty for sharing their great idea and images about the topper. 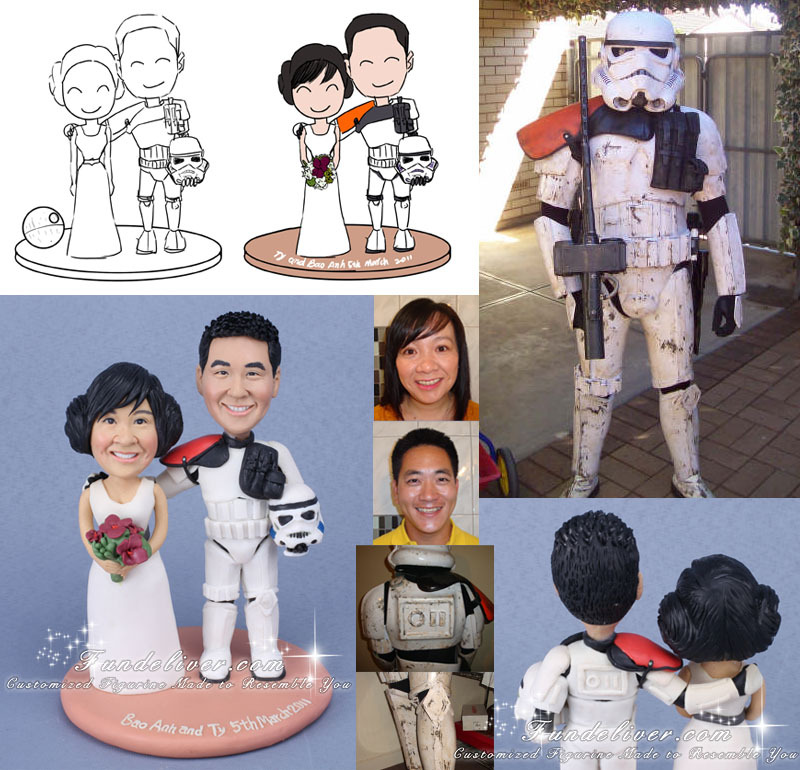 The groom is part of a Star Wars costuming club, and would like groom’s figurine to be in his Sandtrooper armour, and bride in the Princess Leia Celebration costume (the white gown without the braces since bride won’t be wearing them on their wedding). They would like the figurine to be standing side by side with groom’s right hand on bride’s shoulders. The Sandtrooper armour is the key part of the figurine. The main areas are the differences in knee plates on the left and right knee, the left chest-ammo pouch, the right shoulder pauldron (the orange part). These are the main differences between Sandtrooper and Stormtrooper Armour. For our future clients, if you have similar armours or outfits, don’t forget to send us images from different angles, this would be very helpful for us to sculpt the details. Don’t forget to check our Princess Leia and Hans solo cake topper and Star Wars wedding cake topper with Millennium Falcon. These Star Wars wedding cake toppers will add a special touch on your wedding and be great keepsakes for Star Wars fans.